“When in Rome, do as the Romans do!” Giulia Riva is our Rome-based, born-and-bred, blogger and she’s here to show us how best to spend €500 in the Eternal City… come rain or shine. My first day back to work after a wonderful summer trip to Portugal and I was already tired of my ‘real life’ and longing for adventure once more. Luckily, besides a tonne of paperwork waiting for me in the office, I also returned to Rome to find out that a brand new Skrill Prepaid Mastercard, topped up with €500 of credit, had arrived in the post. 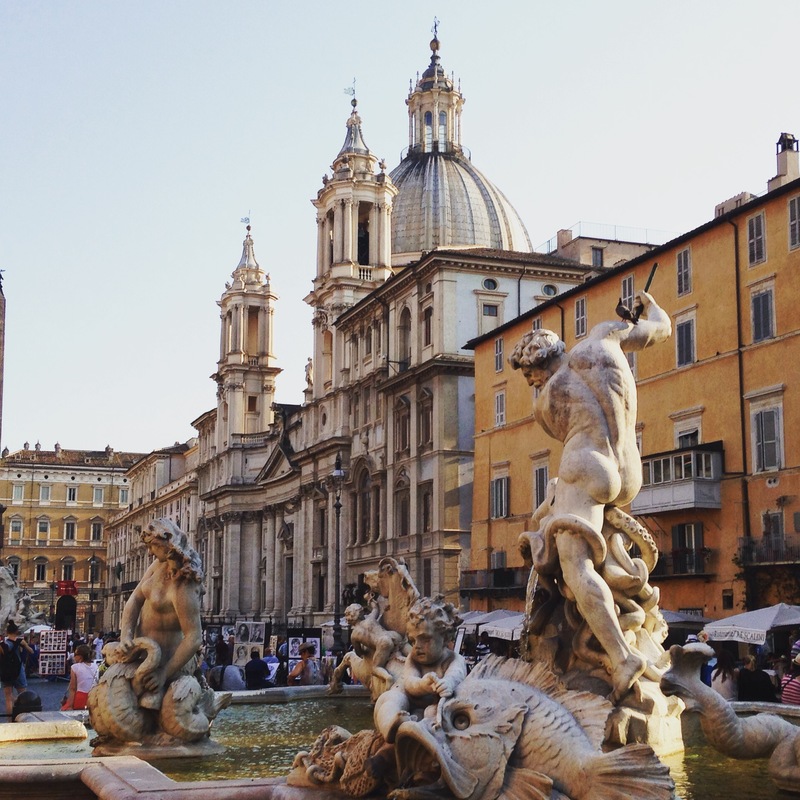 My mission was to Holiday Like A Local, spending the money on all my favourite things to do in my home town – which, needless to say, was a dream come true for a Rome lover and city break enthusiast like me. In fact, I was so enthusiastic that I didn’t care that most of the coolest places in the city, particularly the small and independent ones, would be closed on this bank holiday weekend – as I was confident that I knew my town well enough to still find a host of amazing things to see and do. In fact, as it turned out, the bank holiday was the least of my problems as a huge storm beat down over Rome for most of the weekend. But that didn’t stop me either! So please pack your umbrella and follow me on my grey but wonderful three day staycation…. 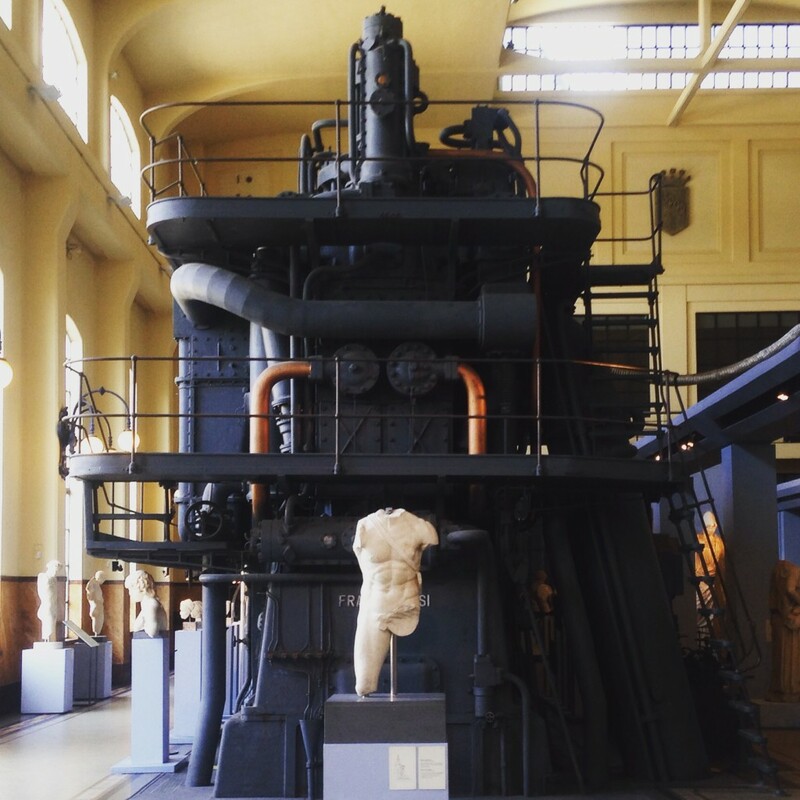 My first stop was the Centrale Montemartini Museum, a former thermoelectric power plant now hosting an exhibition of marble statues from Ancient Rome. 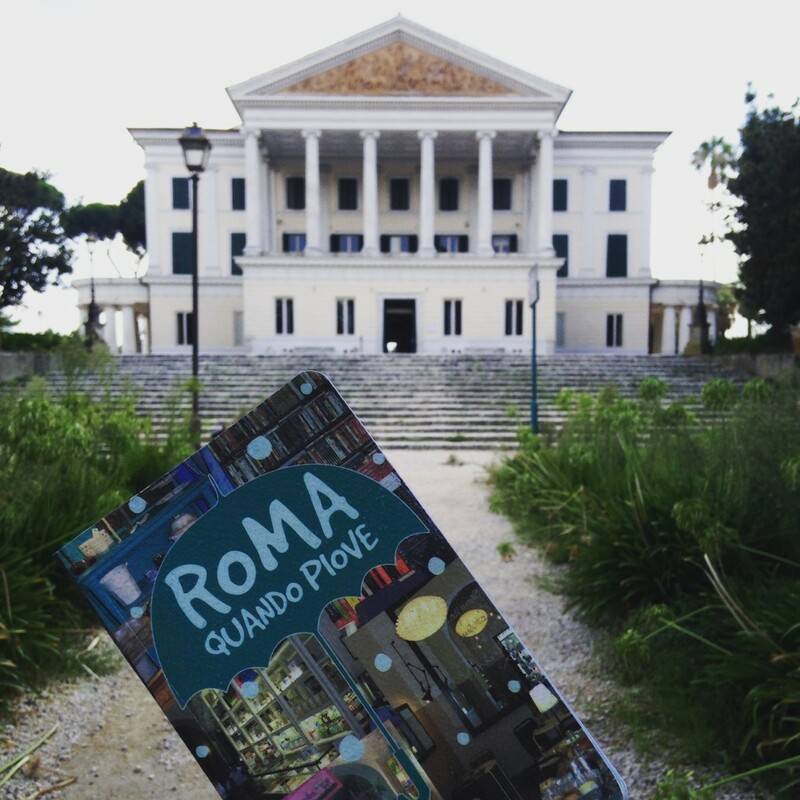 This striking combination started as a lucky coincidence, as in 1995 the famous Capitoline Museum was partially closed to the public for renovation and its Roman statues and ancient mosaics were moved to the abandoned rooms of the city’s first public power plant – where many of them ended up staying. 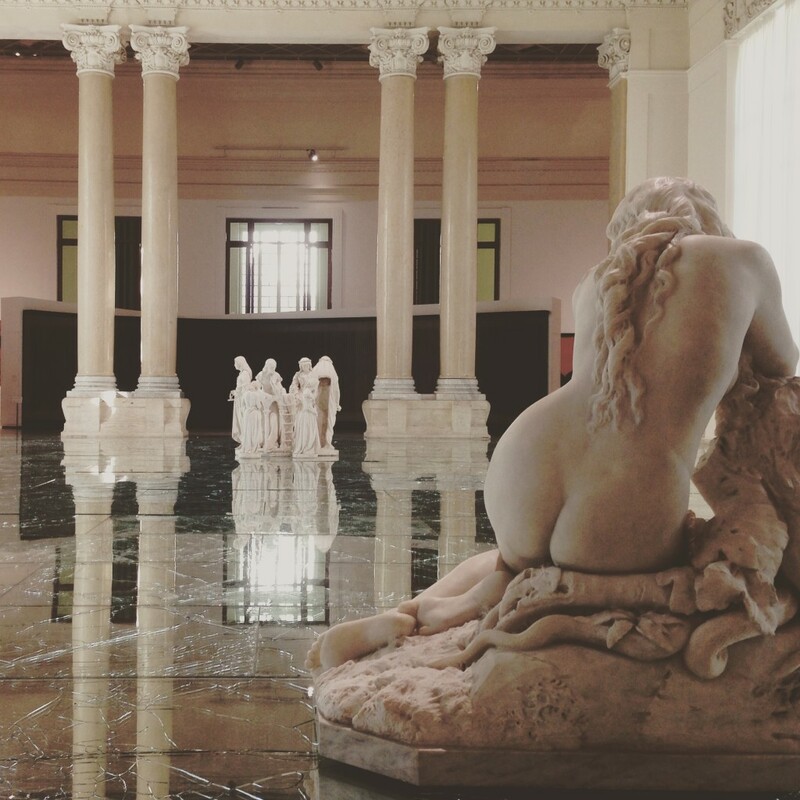 This is my favourite museum in Rome, not only for combining classical art with industrial archaeology, but also because it is always very quiet and soothing, unlike the main branch of the Capitoline Museum downtown. Being a resident in Rome, I paid a discounted entrance ticket of €6,50. Moreover, the founding of this classical art exhibition inside a former industrial complex marked the crucial transition of the Ostiense district into an area now famous for its restaurants and nightlife. 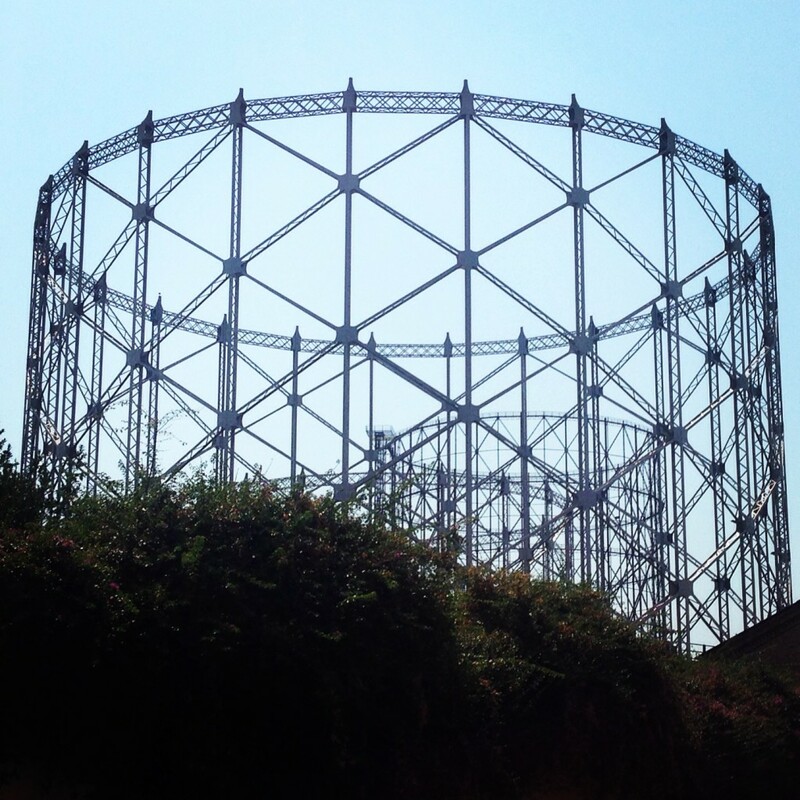 If you like the post-industrial vibes of Ostiense district, you could embark on a (very rewarding, I promise!) graffiti hunt around Via del Porto Fluviale, after which you could check out the Non-catholic Cemetery nearby. As for me, I took a bus to the city centre to start spending some money at the few shops that were open during this bank holiday weekend. 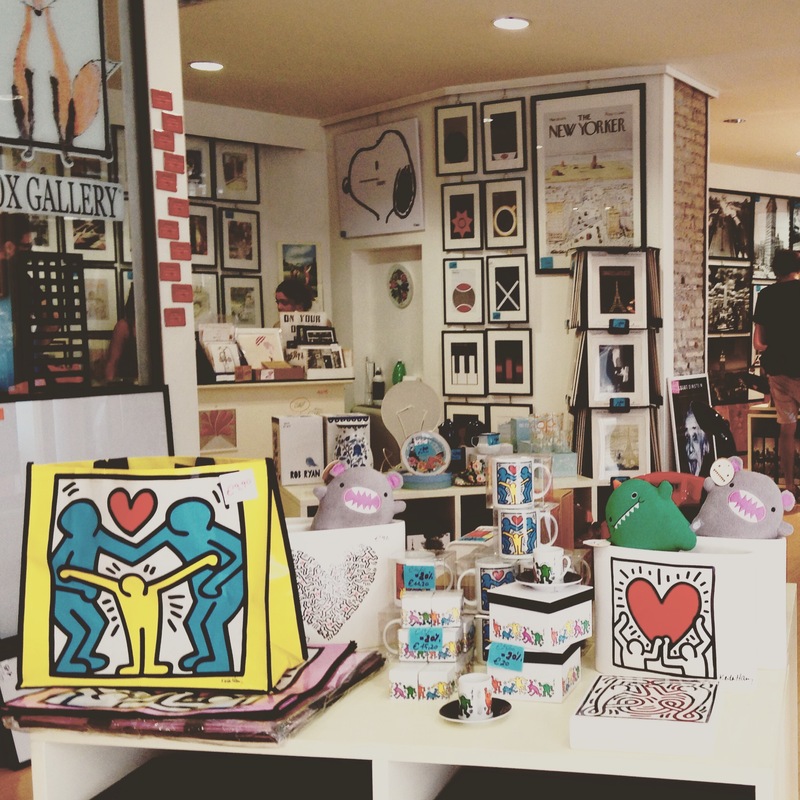 I went to the Fox Gallery, a cool shop selling posters, notebooks and artsy stuff, where I found a roll of wrapping paper with a vintage world map design, an art-therapy book for my inner child to colour in and a serendipitous book called ‘Sidewalks: a journal for exploring your city’. To loosen up after the first shopping session of the weekend I went to Giolitti, one of the oldest and most renowned cafés in Rome, which – despite the ubiquitous long line of tourists – still serves a great coffee and my favourite ice-cream in town (and it keeps its prices low – €2,5 for a small cup. 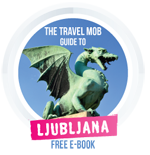 Unless you want to get a seat inside its art-nouveau room, which costs extra). I kept wandering around the city centre looking for some more nice stuff to buy, but all shops were either closed or too fancy, and so I just indulged in street photography to show you guys the pleasure of even a simple stroll in Rome. 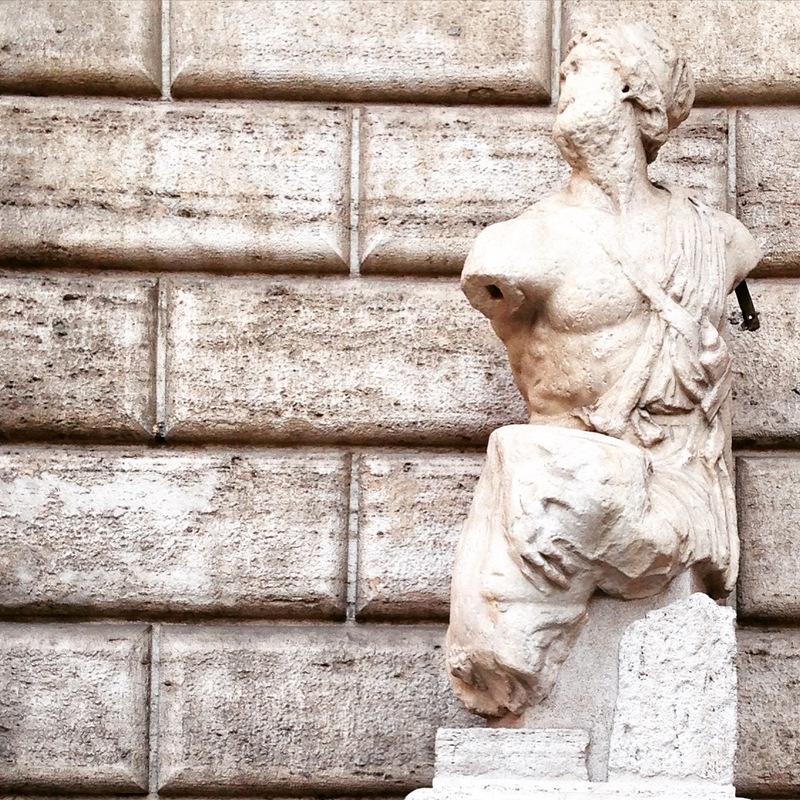 While doing so, I walked past the ‘talking statue’ of Pasquino, next to which, since the 16th century, satirical poems in the Roman dialect were held. Lately the statue is ‘mute’, but the street poetry scene in Rome isn’t dead: just wait until tomorrow night and you will see! Locals don’t eat in the city centre, as it is full of average quality tourist traps, so for dinner I joined a friend in the Piazza Sempione zone, one of the pivotal points of the northern outskirts of Rome. Being my first day of staycation I wanted to keep it low-profile, so we went to a beer garden overlooking the river Aniene, which is a small river that runs across a beautiful natural park. The DeRiva Aniene garden is cosy and very colourful. 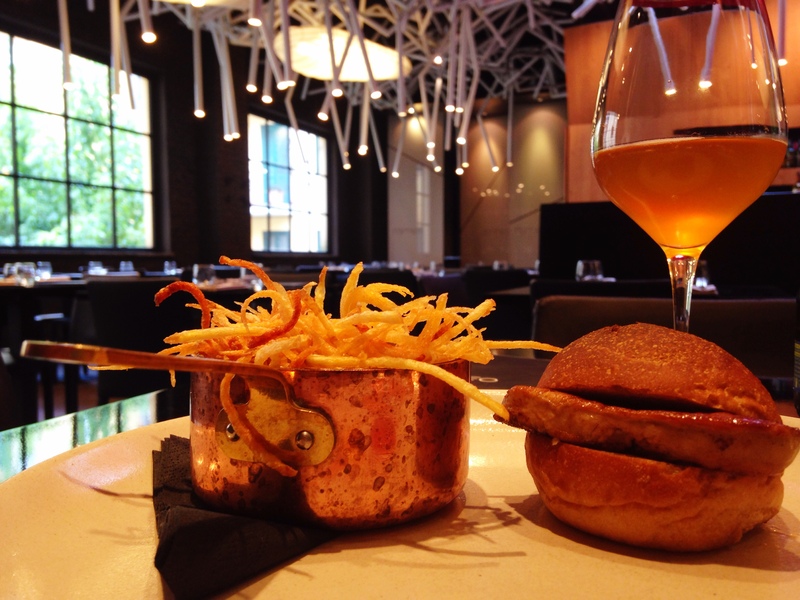 Here we had a chicken burger and a craft beer for a total of €11 per person. Three choices… toilet, beer or cocktail. The night was still young, and at Riva Aniene it didn’t seem to get started, so we decided to go to ‘Feria’, the summer festival taking place on the rooftop of Lanificio159, which is one of the coolest post-industrial cultural venues in town. Being a former woollen mill, the place is huge and made of several different thematic areas but, unfortunately, the only one open during the summer is the rooftop of the factory. Here we had a couple of beers (at €4 each) and danced the night out. For a video round up of day #1 check out my vlog! Great! Not only almost every place in town was closed, but also I needed to find something to do under a roof. While my posh day at the rooftop swimming pool would clearly have to be postponed, I made a new plan for the morning and took a bus to Campo de’ Fiori where I visited the Palazzo della Cancelleria, a Renaissance palace currently hosting a temporary exhibition of Leonardo Da Vinci’s machines. I’ve always been fascinated by Leonardo’s genius, and so I really had fun at the exhibition where I could try some of the machines and even act stupid inside the mirror room. 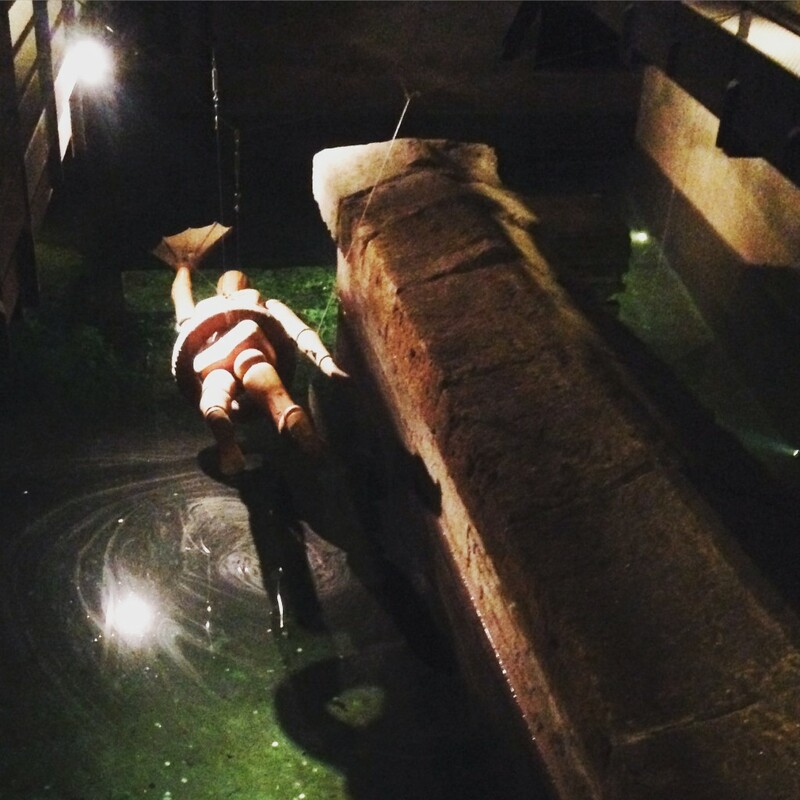 But the real quirky thing about the Palazzo della Cancelleria is that underneath it (and therefore underneath one of the most popular squares in the city centre) there is a real lake submerging a Roman tomb, which you can see once you get a ticket for the current exhibition. Cost for the Leonardo Da Vinci exhibition = €9. Annoying, but at least I can now show you a completely empty Piazza Navona, which is something very rare to witness, trust me! I took shelter inside Vivi Bistrot, a nice café on the square, which magically isn’t a tourist trap like all other restaurants of the area. I guess it’s not a complete secret either as there was an American film crew behind the counter shooting a ‘real Italian life’ documentary. Not wanting to be second best, as soon as they left I asked the waiter to prepare something typically Italian for my camera too and he made me a cappuccino (for €1,20). As soon as the rain stopped (finally! ), I seized the moment and walked to the posh neighbourhood of Prati, which I love to visit in August when all the offices, courthouses and fancy shops are closed. During this time the otherwise hectic ‘hood is quiet and I can stroll along its tree-lined boulevards admiring its beautiful Umbertino buildings (a typical Italian architectural style from the end of the 19th century). Here I went to Romeo, a boutique bakery and restaurant by the Michelin starred chef Cristina Bowerman. Usually I eat at the bakery but this time, emboldened by the healthy credit still on my SPPMC (Skrill Prepaid Mastercard! 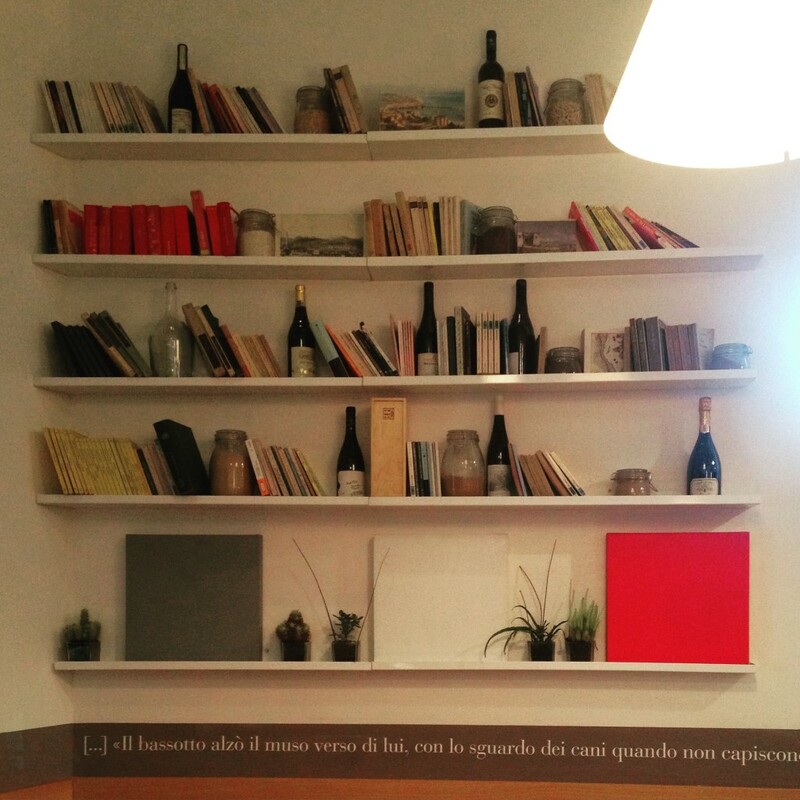 ), I selected a seat in the second room, the à-la-carte restaurant, and enjoyed a sandwich made of liquorice bread and fois gras served with mango ketchup, wine mayo and fries, followed by a gazpacho with melanzane alla parmigiana, a classic Campanian dish of aubergine baked with tomato sauce and mozzarella. Despite being a Michelin starred restaurant, here I paid just €34. The weather was still uncertain and so I opted for another indoor activity, taking a taxi to Villa Torlonia, a park with three museums, a restaurant and several war bunkers. As there were no tours of the bunkers available on a bank holiday, I decided to visit the Casina delle Civette (The House of the Owls), a very peculiar construction from the 19th century built in a mixture of styles, with interesting decorative details and architectural elements such as loggias, porticos, turrets – and of course the ubiquitous stained glass windows. 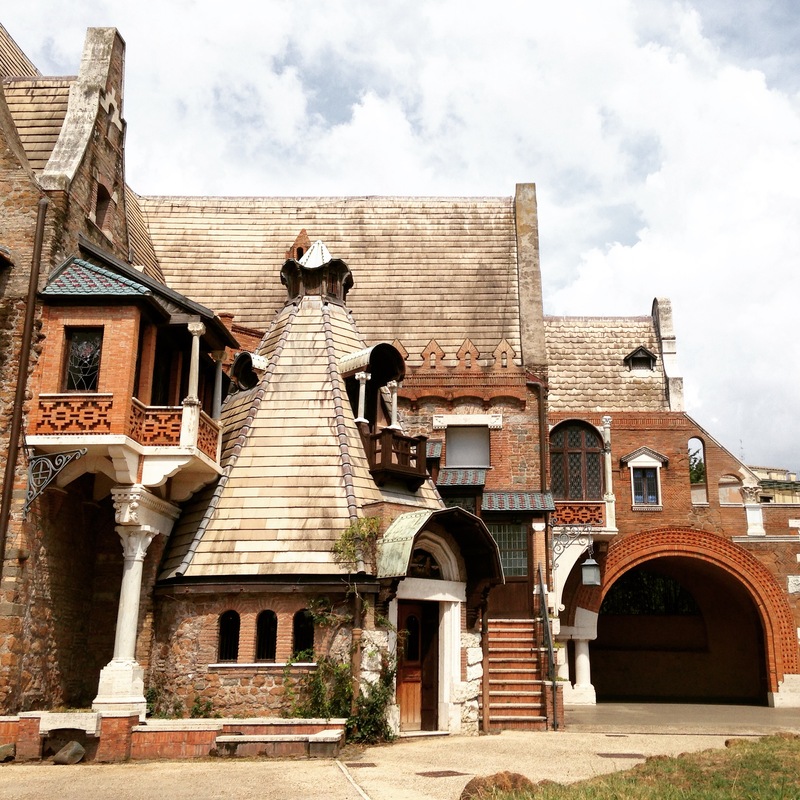 The House of the Owls hosts the Art-Nouveau Museum, a lovely hidden gem among Rome’s museums. This art nouveau museum is a real hoot! …and while I was at it I added two more books about Rome to my staycation expenditure: one featuring stories of rebellion in Rome and one about quirky places along the G.R.A., which is Rome’s ring road. Damage done at the museum bookshop: €41,50. As soon as I began consulting my new book, the rain stopped and so I decided to join a couple of friends at Villa Pamphili, a big park in western Rome. Here we rented three bikes (€15 each) and explored the park, from the ‘Casino del Bel Respiro’ and its secret gardens as far as the lake and the wilder area of the park. I used to come here with my grandfather, and so last time I was biking around Villa Pamphili my bike still had its trainer wheels on. This time instead, despite people saying that you never forget how to bike, I spent most of the afternoon pushing the bike with my arms, until I eventually gave up on cycling and sat down at Vivi Bistrot (they have two branches) for a much more satisfying beer tasting, while pondering over the idea of joining the free yoga class at 7pm. (I didn’t). For dinner we went to Flavio al Velavevodetto, which literally means ‘I told you so’, from the sentence Flavio is rumoured to have said when he quit his job as a chef in one of the most popular restaurants in Rome to open his own place. At Flavio’s the cuisine is traditional, and as rich and greasy as only Roman dishes can be, but we washed the meal down with several glasses of white wine. Here I paid €102, including two bottles of wine. 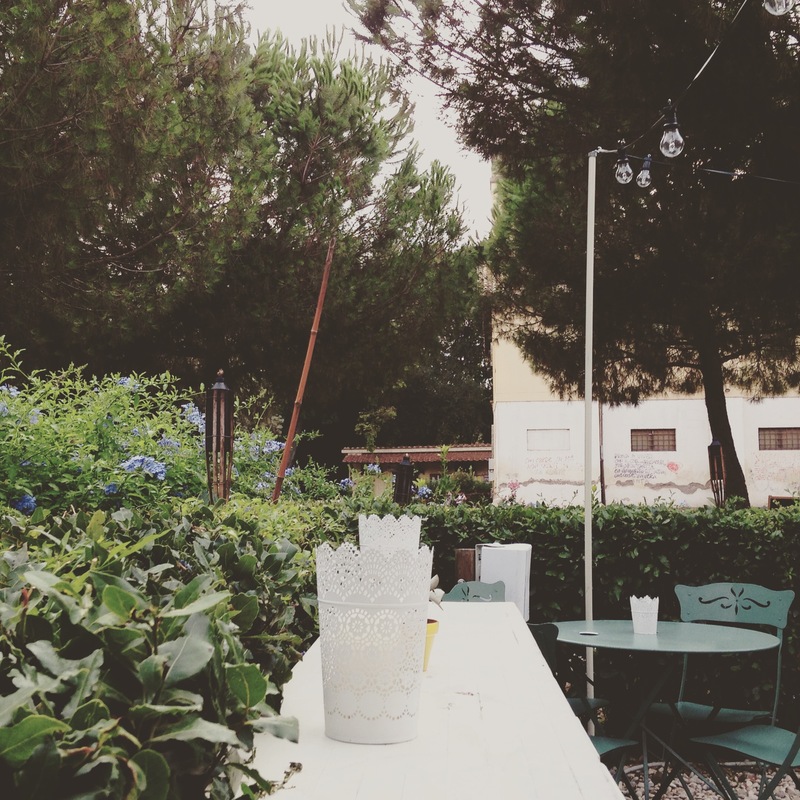 As I mentioned in my ‘Secret Seven’ post about Rome for Urban Travel Blog, one of my favourite things to do in town is attending a summer event known as ‘Estate Romana’, an umbrella name for all kinds of cultural activities taking place during summer. 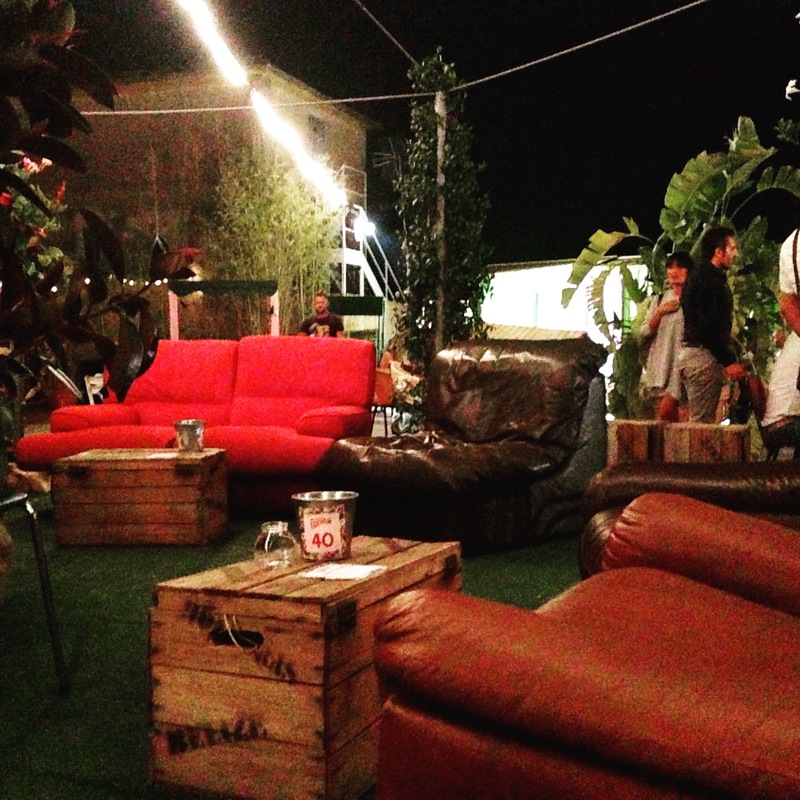 One of my favourite festivals under the ‘Estate Romana’ umbrella is Eutropia and it takes place inside the ex-slaughterhouse in the Testaccio district. Eutropia is basically a music festival, but on this night it hosted a street poetry reading by Poeti del Trullo (Trullo is an area in western Rome often associated with criminality). 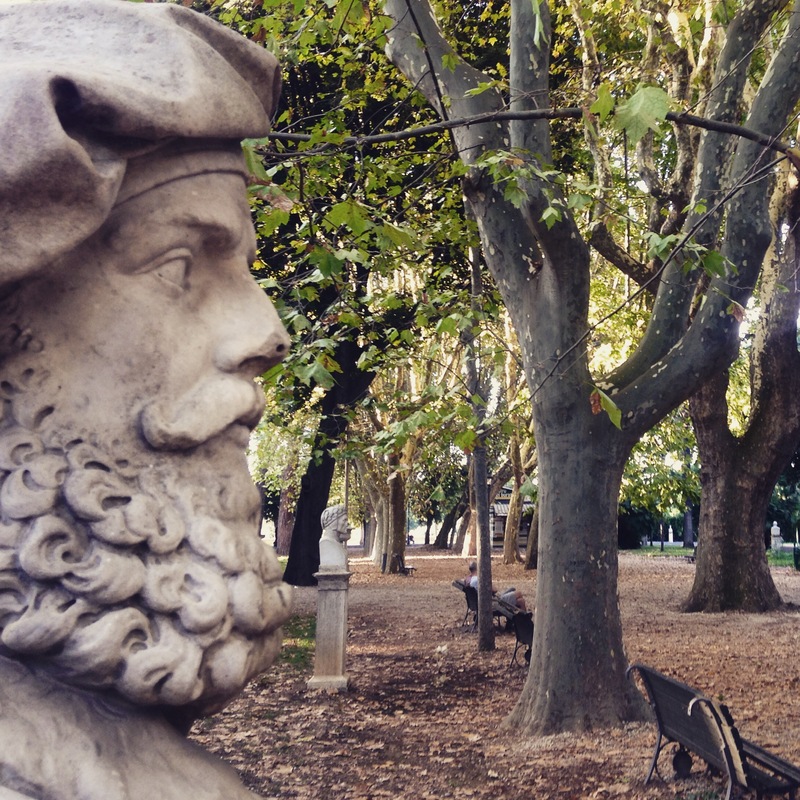 And so, even if Pasquino is no longer lampooning from his popular corner near Piazza Navona, the walls of Rome are still speaking in rhymes in the Trullo hood, where seven poets are hanging on walls or on lampposts, their harsh poems written in Roman dialect. Back at the festival and the night’s poems were accompanied with some traditional Roman stornello (which is a sort of folk song) and two popular folk singers, Lucilla Galeazzi and Giulia Anania, performed several well known songs about Rome, making the crowd clap to the beat. It was a very special night soaked in that genuine ‘Romanity’ that I find increasingly rare these days, as everything becomes more and more commercialised. Normally you’ll only find mariachi bands in touristy restaurants that still play stornelli, so it was great to hear them in this authentic environment. The entrance to the festival was free, but I couldn’t help buying a poetry book by Poeti del Trullo at €10 and I also bought a round of beers for €25. For a video round up of day #2 check out my vlog! I spent the morning waiting for the rain to stop, until it was pretty obvious that once again I had to set aside the idea of spending the day at one of the city’s luxurious rooftop swimming pools. Luckily, Rome’s museums were open even on a bank holiday and their exhibits are so varied that I was just spoiled for choice. But before I even left the house, I first downloaded the Skrill app to check my card balance – and when I saw that there were still 100€ left I decided to go back to Prati neighbourhood to spoil myself with another fancy meal and check out a quirky museum over there, the video games museum, where I could play at some old classics of my generation such as Pacman and Bubble Bobble for an entrance ticket of €8. It was time to eat something, so I headed to Settembrini. Usually I visit the most informal area of the restaurant, a library with wooden tables on which you can nibble something casual such as cheeses and cold cuts, but this time, equipped with my still-credit-carrying Skrill Prepaid Mastercard, I could enter the ‘real’ restaurant, where I enjoyed a fish burger with potatoes and a couple of glasses of white wine for €28. 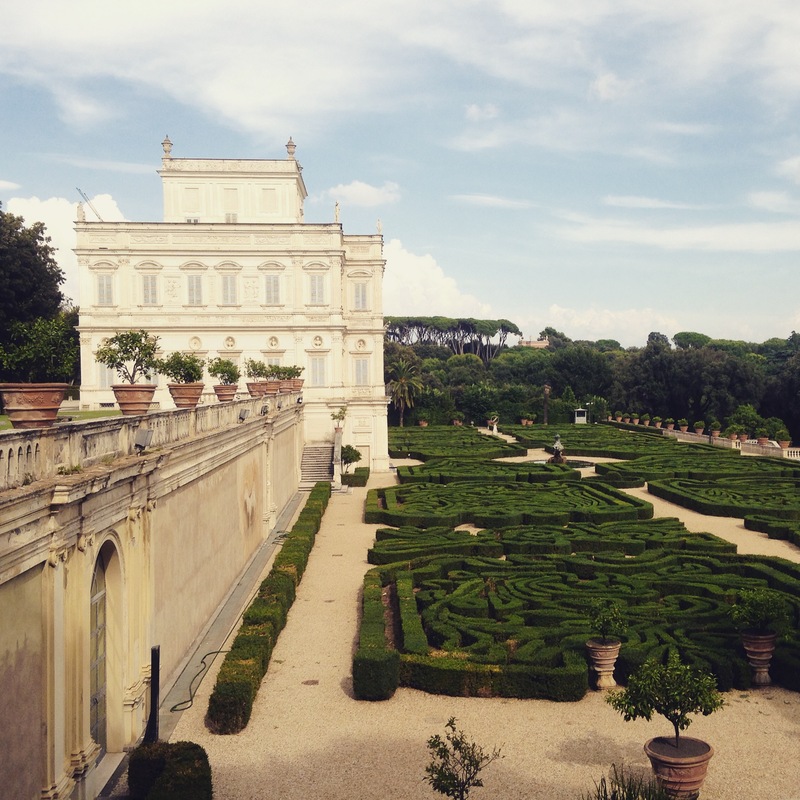 It seemed it could have rained forever but, at this point, I put up with it and stuck to my original plan of spending the afternoon at Villa Borghese, and elegant park not so far from the city centre. First things first, I went to the Shakespeare’s Globe Theatre to buy two tickets for ‘Much ado about nothing’. As, even after my extravagant lunch, I still had some credit left on my SPPMC I bought two very central seats at €27 each. The play was at 9pm, so I had the whole afternoon to spend at the park. Villa Borghese is full of places to see, from touristy spots, such as the lake, the Pincio terrace and the – anyway beautiful – Galleria Borghese and some more local hang-outs, such as the zoo, the Carlo Bilotti Museum and the Children’s Cinema. 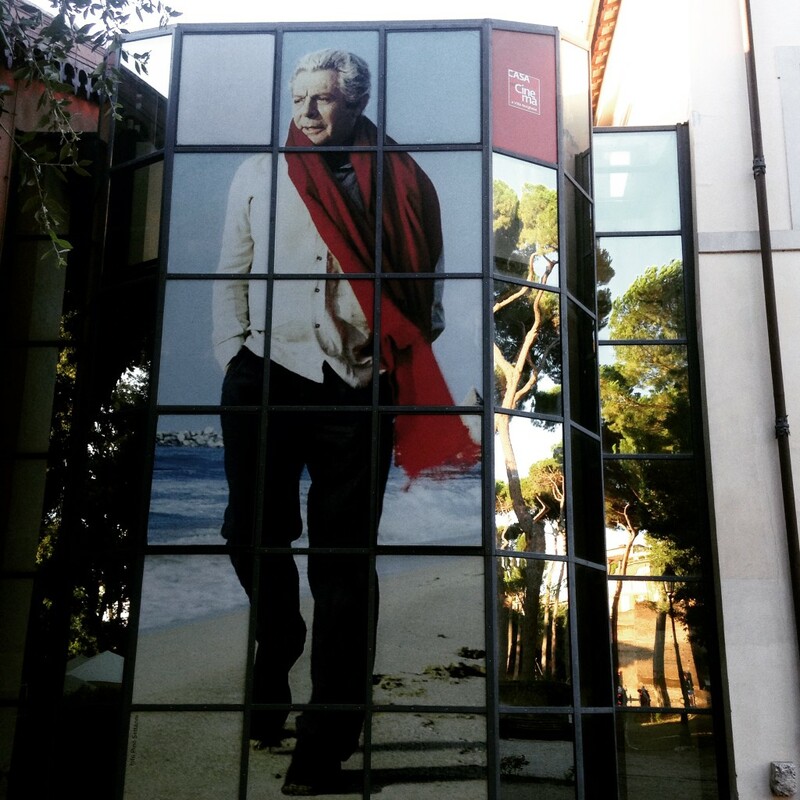 I opted for the Modern Art Gallery, which displays 20th-century paintings and sculptures by well-known artists such as Andy Warhol, Van Gogh, Klimt and – of course – all the Italian vanguards. After wandering around the park as far as the panoramic terrace, I went to the Casa del Cinema (the Cinema House), a place devoted to film festivals and indie movies. A friend joined me there and we ordered one ‘aperitivo’ served with canapés. We paid €9 each, but at least we didn’t have to worry about an empty stomach during a 3-hour play! When the play was about to start, we left the Casa del Cinema and took our VIP seats at the Shakespeare’s Globe Theatre, which is an actual wooden Elizabethan theatre like the popular one in London. It was the first time that I attended a play at the Globe and I loved the fact that the architecture plays a big role in the show too. Coming back home after the play, I couldn’t help thinking that Rome never disappoints me. Even under the rain, I had an amazing staycation and the best part of it is that, for once, I won’t suffer from post holiday syndrome. Click for a video round up of day #3 on my vlog. Giulia would like to thank Skrill for generously sending over one of their Skrill Prepaid Mastercards enabling her to Holiday Like A Local. The card was a handy travel companion, which you can use as a credit card accepted at 35.9 million locations worldwide, or at ATMs, and which you can top up to match your holiday budget. For more info on both Skrill and their SPPMC head to Skrill.com. Meanwhile check out our insider tips from Barcelona, when Duncan Rhodes went on Holiday Like A Local… you can check back for adventures in London, Paris and New York in the coming weeks too! 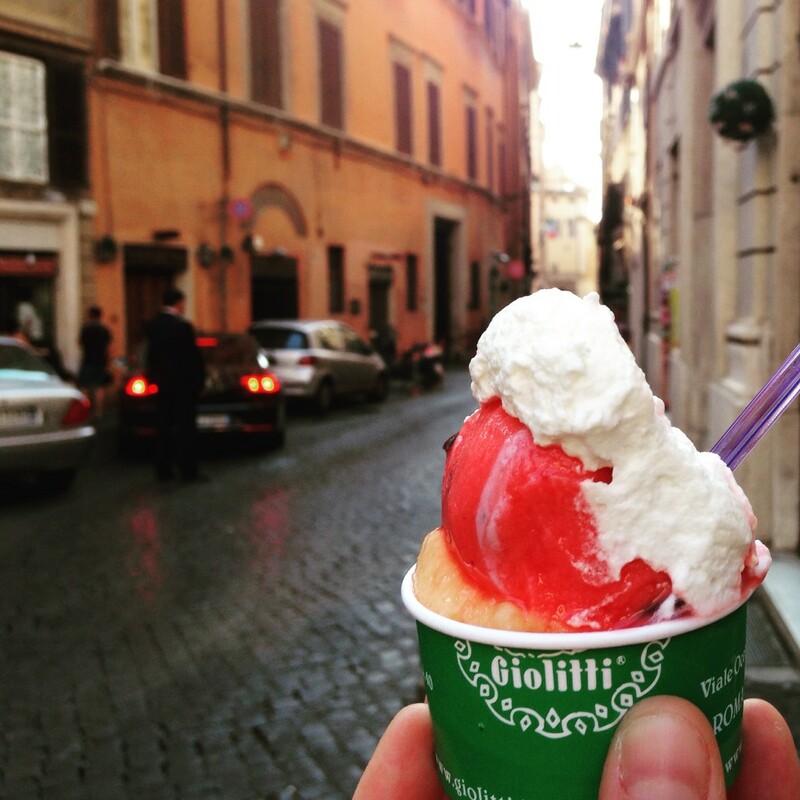 Finally, if you’re coming to Rome be sure to check our Long Weekend guide to the Eternal City. This is such a wonderful article – I love that you explored your own city and you got to highlight so many different features of the city. 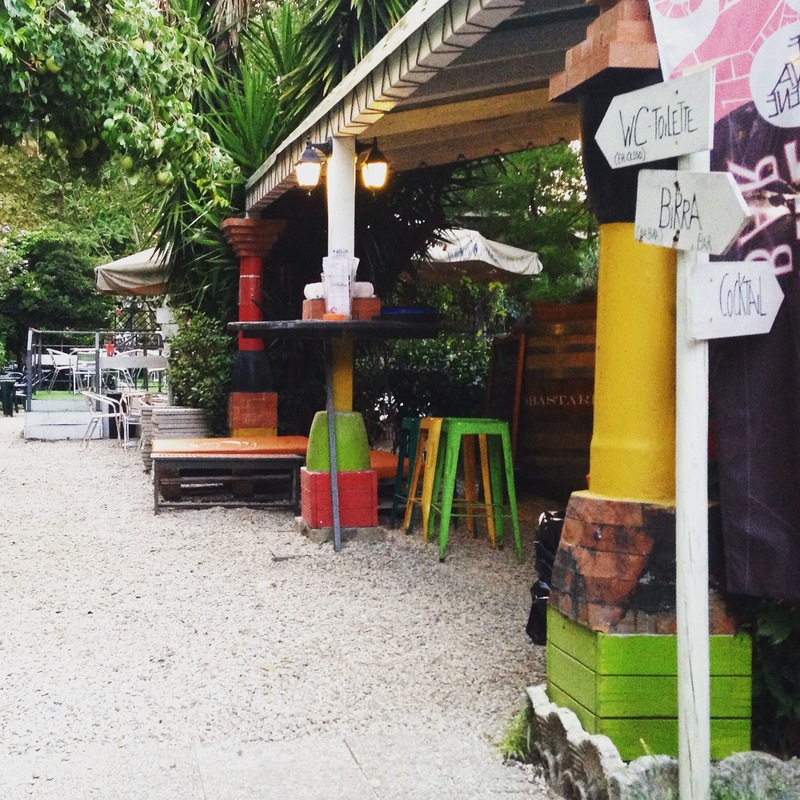 From food to bars, to galleries and plays.